Jewish-French director Radu Mihaileanu offers up his exploration of the patriarchal problems of traditional Islamic society in comedy drama The Source (La Source des Demmes, 2011). Set in an unnamed village, women are forced by their husbands to fetch water from a treacherous well upon the mountain side. When the friend of headstrong Leila (Leïla Bekhti) miscarries as a result of a fall on the path, she decides to lead the women of the village in a ‘love strike’ to express their discontent. Milhaileanu’s decision not to give the film’s village an exact setting allows for a more universal canvas on which to paint his poetic portrait of some of the most problematic issues facing modern Islamic society. The Source clearly draws on notable recent political events in the Middle East and Europe, including an actual ‘love strike’ that took place in 2011. Yet despite being influenced by real life events, there is clearly a fairy-tale element present in the comic and equally tragic narrative. There are strong performances from the leading cast, in particular the semi outcast matriarch Vieux Fusil, played with great gusto by Biyouna. Bekhti’s performance as Leïla balances a sense of tenderness with ferocious female passion, encapsulating the drive for change in an out-dated society. In many ways, The Source can be seen as a mash-up of Nigel Cole’s Made in Dagenham (2010) and Asghar Farhadi’s A Separation (2011), striking a balance between very serious issues and the selective use of humour. The greatest problem with The Source is that, whilst is promises an interesting exploration of many key issues of Islamic society, it fails to deliver. This is largely down to the lumbering run time that is crying out to be trimmed of the unnecessary subplots, including a secondary character’s love affair and the arrival of Leïla’s former boyfriend. Both of these plots greatly distract from the far superior central strand. 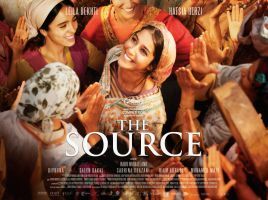 The Source, whilst far from perfect, offers an interesting and beautifully made picture of some important issues surround women’s rights in patriarchal societies. Trimmed of the fat, this film would have the potential to be something much more remarkable – sadly, this is not quite the case.